The ultimate crop species would grow quickly, respond well to fertilizer, and resist herbivores and disease. But is this a realistic possibility? The ultimate crop species would grow quickly, respond well to fertilizer, and resist herbivores and disease. But is this a realistic possibility? Plant defence theory suggests there is a trade-off: plants can either grow fast or have good resistance to insects, but not both. That trade-off could also affect the reliance of plants on predators of insects, also known as biocontrol, to protect them from insect damage. New research indicates that it may be difficult for such a superplant to develop in nature. Whether this result holds for all plants and whether crop breeding can break the trade-off between growth and insect tolerance are debated. Aphids (Aphis nerii) feed on Asclepias incarnate, one of the milkweed species studied. Photo courtesy of Kailen Mooney, University of California at Irvine. To study the effects of soil nutrients and predators on plant herbivores and plant growth, Dr. Kailen Mooney and his colleagues at Cornell University in Ithaca, New York, compared 16 milkweed species that occur naturally throughout North, Central and South America. “Maybe the best of all worlds would be to take advantage of nutrients in soil efficiently, to grow quickly, to be resistant to herbivores, and to receive a large benefit from predators of herbivores,” says Mooney, who is now an assistant professor at the University of California at Irvine. The milkweeds’ herbivores were aphids, and the predators were ladybug and syrphid fly larvae, which eat aphids. 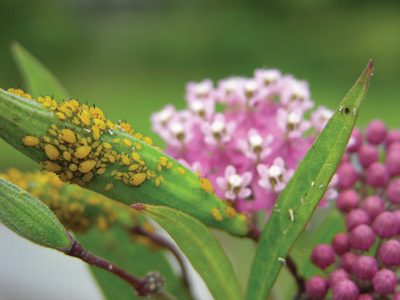 The researchers examined whether there was a consistent trade-off between plant growth and resistance to aphids, and tested the effects of fertilizer and predators on milkweed growth and aphid densities. The 16 milkweed species, planted in the same field, varied in growth rate. A growth–defence trade-off occurred, with the faster growing milkweed species having lower resistance to aphids (higher aphid densities) and the slower growing milkweed species having higher resistance to aphids. By accounting for the degree of relatedness among the milkweed species, the researchers concluded that the same pairs of traits evolved together multiple times, rather than once in a common plant ancestor. “Even though, from a plant’s perspective, it would be more advantageous to be fast growing and to have a strong immunity to insects, in looking at these 16 species, we see that they have one or the other, and can’t have both,” explains Mooney. However, Dr. Istvan Rajcan, a soybean breeder and geneticist at the University of Guelph in Ontario, disagrees with this conclusion. “In plant breeding, we often screen hundreds, if not thousands, of different genotypes of the crop species to find resistance to a pest or disease. Once found, this resistance is transferred to high-yielding cultivars through hybridization, selection, and breeding,” he says. Although the initial plant material might not be fast growing or high yielding, crop breeders have been able to transfer resistance to more productive plant lines. A yield drag can occur in the new plant line, but Rajcan says he would not call it a common problem. “Perhaps in nature, the resistant genotypes may not be favoured by the environment as much as the fast-growing, susceptible ones, but it is not true that the combination of these traits is not possible,” he says. As an example, he cites the Rag1 gene, which gives soybean plants resistance to soybean aphid biotypes. Rag1 has been bred successfully into high-yielding soybean lines without producing a yield lag. Because of the trade-off between plant growth and defence, the Cornell researchers thought that the fast-growing, insect-intolerant species should benefit most from biocontrol by aphid predators. They were surprised to find that was not the case. “Some species barely increased their growth when fertilized; they could be fast- or slow-growing species, but they had little response to fertilizer,” explains Mooney. For those species, he says, the presence of aphid predators had little ability to increase plant growth. In contrast, the species that increased growth most when fertilized also benefited most from aphid predators. This idea remains to be tested, but if supported, could alter crop protection strategies. Reference: Mooney, K.A., R. Halitschke, A. Kessler, and A.A. Agrawal. 2010. Evolutionary trade-offs in plants mediate the strength of trophic cascades. Science 237:1642-1644.